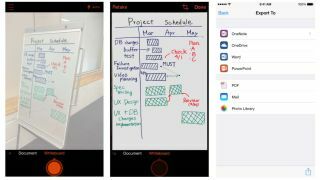 After an initial popular launch of Office Lens for the Windows Phone platform, Microsoft is now mobile scanner app for iPhone and Android smartphones. The app turns your smartphone into a convenient, portable scanner where you can convert physical documents into digital files. "Use it to take pictures of receipts, business cards, menus, whiteboards or sticky notes - then let Office Lens crop, enhance and save to OneNote," Microsoft said in a statement. "Just like that - all the scanned images you capture from Office Lens are accessible on all your devices." The simplicity of Office Lens is that it automatically recognizes the corners of a document, and then the software will crop, enhance, and clean up the scanned image. This algorithm and automatic adjustments allow you to take a photo of a whiteboard or a document at an angle, and Office Lens will give you a perfect scan every time. Thanks to optical character recognition (OCR), there are other simple integrations depending on the content type. For example, a scan of a business card will automatically parse the card and generate contacts with the appropriate name, number, email address, and address fields. Paper document scans can be converted into Word documents, PowerPoint presentations and PDF files, and users can easily edit or reformat the scans. Scans can also be uploaded to OneNote and to Microsoft's OneDrive cloud storage. With Office Lens, enterprise customers benefit in that they no longer need to choose to carry a digital tablet with a digital stylus or pen to capture digital notes. With Office Lens, users will have the convenience of regular pen and paper, and they can digitize their notes easily with their phones. Traditional pen and paper is not only more readily accessible - in case you forget your Surface Pro 3 or Galaxy Note Pro 12.2 - but it also feels more natural and comfortable than gliding the plastic nib of a digital pen over a glass screen. Office Lens is now available for iPhone users through the App Store as a free download. The app is also available in preview for Android users. Android users wishing to join the preview can join the Google+ group and sign up to be a beta tester.